Share the post "Hullabaloo! The Life and (Mis)Adventures of L.A. Radio Legend Dave Hull"
Some of us remember what warm human contact was like before the world whirled into its present digital direction. Some of us remember when even in the fantasyland of entertainment and public personalities, you could grow up with a close, almost one-on-one relationship with a “star” who was more home-town hero than international celebrity. And those kinds of heroes came right out of our radios. They were disc jockeys; a near-extinct elite that helped so many of us ease from childhood, weather the tumult of our teen years, and (in some cases, at least) become exemplary pillars in the adult community. Dave Hull “the Hullabalooer” rates as one of the very best. He had a hit song written about him. He had a Baskins-Robbins ice cream flavor named after him. His Hullabaloo night club on the Sunset Strip presented every top name act in the business, from Sonny and Cher to the Byrds. Whether you lived through those times, or just heard about them from parents (or even grandparents! 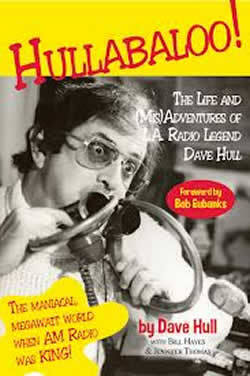 ), Dave’s new book, Hullabaloo! The Life and (Mis)Adventures of L.A. Radio Legend Dave Hull will take you on a fun-filled trip back into an era of way more innocence and far less complexity. Back to when there were no podcasts, global satellite stations, or streaming internet audio and video feeds from anywhere and everywhere. What you had instead were local voices, and personalities who became your friend. They knew you and they knew your town. They answered your requests for your favorite tunes and they made you laugh. They dedicated songs to your “steady.” They woke you up and rocked you to sleep. And they came to you via a nine-volt battery, ten transistors, and just two dials. The truly great DJs would speak directly to you, individually, while filling the cosmos with airwaves of magic and enjoyment for millions. It was fun and it was comfort. Dave’s story is multifold. His personal journey “up and down the dial” weaves into the evolution of commercial radio from the 1940s to the present, and all of that is presented with a soundtrack-in-words that ranges from Tennessee Ernie Ford to the Beatles and beyond. After launching his radio career on Armed Forces Radio in the early 1950s, Dave Hull took off into a commercial craziness that powered him from Roswell, New Mexico, to Ohio to Michigan to Florida and finally to the mass-market of Los Angeles. In L.A., the Hullabalooer soared to number one in the ratings and even higher than that in the hearts of young listeners. He was genuinely as unforgettable and important a part of their growing up as a first kiss or the measles! The graphics, photos, and archival material included in Hullabaloo! provide the perfect billboards for the ride. Photos of Dave with the Beatles and the Rolling Stones; in-studio shots of his daily “tumultuous uproar” behind the microphone with horns, whistles, and bells; and his ever-wacky station promo events like “The Great Golf Cart Race” truly help to elevate Hullabaloo! to the level of a textbook—albeit a zany one!—for those interested in the history of pop culture and music in America. Dave’s co-writers, Bill Hayes and Jennifer Thomas, are a writing-editing team with a combined five acclaimed books to their literary credit. But the 600-page Hullabaloo! is a rare example of love, legacy, and lunacy that will do more than entertain and enlighten; it will help to preserve a precious piece of vanishing American culture that should never be forgotten—for those who were there, and for those who can only wish they had been!